For the 2011 animated film, see Ivan Tsarevich and the Gray Wolf (film). 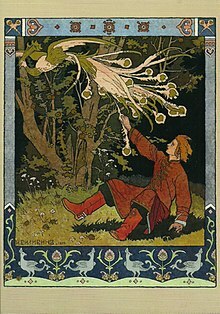 "Tsarevich Ivan, the Firebird and the Gray Wolf" (Russian: Сказка об Иване-царевиче, жар-птице и о сером волке) is a Russian fairy tale collected by Alexander Afanasyev in Narodnye russkie skazki. It is Aarne-Thompson type 550, the quest for the golden bird/firebird. Others of this type include "The Golden Bird", "The Greek Princess and the Young Gardener", "The Bird 'Grip'", "How Ian Direach got the Blue Falcon", and "The Nunda, Eater of People". A king's apple tree bore golden apples, but every night, one was stolen. Guards reported that the Firebird stole them. The king told his two oldest sons that the one who caught the bird would receive half his kingdom and be his heir. They drew lots to see who would be first, but both fell asleep; they tried to claim it had not come, but it had stolen an apple. Finally Ivan Tsarevich, the youngest son, asked to try; his father was reluctant because of his youth but consented. Ivan remained awake the entire time, and upon seeing the bird, tried to catch it by the tail. Unfortunately, Ivan only managed to grasp one feather. The Firebird did not return, but the king longed for the bird. He said that still, whoever caught it would have half his kingdom and be his heir. The older brothers set out. They came to a stone that said whoever took one road would know hunger and cold; whoever took the second would live, though his horse would die; and whoever took the third would die, though his horse would live. They did not know which way to take, and so took up an idle life. Ivan begged to be allowed to go until his father yielded. He took the second road, and a wolf ate his horse. He walked until he was exhausted, and the wolf offered to carry him. It brought him to the garden where the firebird was and told him to take it out without touching its golden cage. The prince went in, but thought it was a great pity not to take the cage, but when he touched it, bells rang, waking everyone, and he was captured. He told his story, and the First King said he could have had it for the asking, but he could be spared now only if he could present the king with the Horse with the Golden Mane. He met the wolf and admitted to his disobedience. It carried him to the kingdom and stables where he could get the horse and warned him against the golden bridle. Its beauty tempted him, and he touched it, and instruments of brass sounded. He was captured, and the Second King told him that if he had come with the word, he would have given him the horse, but now he would be spared only if he brought him Helen the Beautiful to be his wife. Ivan went back to the wolf, confessed, and was brought to her castle. 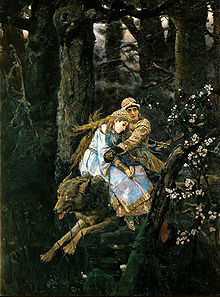 The wolf carried her off, but Ivan was able to assuage her fears. Ivan brought her back to the Second King, but wept because they had come to love each other. The wolf turned itself into the form of the princess and had Ivan exchange it for the Horse with the Golden Mane. Ivan and Helen rode off on the Horse. The wolf escaped the king. It reached Ivan and Helen, and Helen rode the horse and Ivan the wolf. Ivan asked the wolf to become like the horse and let him exchange it for the Firebird, so that he could keep the horse as well. The wolf agreed, the exchange was done, and Ivan returned to his own kingdom with Helen, the horse, and the Firebird. The wolf said its service was done when they returned to where it had eaten Ivan's horse. Ivan dismounted and lamented their parting. They went on for a time and slept. His older brothers found them, killed Ivan, sliced his body to pieces, and told Helen that they would kill her if she would not say that they had fairly won the horse, the firebird, and her. They brought them to their father, and the second son received half the kingdom, and the oldest was to marry Helen. The Grey Wolf found Ivan's body and caught two fledgling crows that would have eaten it. Their mother pleaded for them, and the wolf sent her to fetch the water of death, which restored the body, and the water of life, which revived him. The wolf carried him to the wedding in time to stop it; the older brothers were made servants or killed by the wolf, but Ivan married Helen and lived happily with her. ^ The Tale of Tsarevich Ivan, the Firebird, and the Grey Wolf (Illustrated). ISBN 9781909115118. ^ Post Wheeler, Russian Wonder Tales, "Foreword"
^ Heidi Anne Heiner, "Tales Similar to the Firebird"
This page was last edited on 16 February 2019, at 12:39 (UTC).